With no headphone jacks and optional notches, Huawei’s P20 phones are leading Android’s 2018 redesign trend, despite being iPhone X-esque. Despite Samsung’s dominance in the Android world, it’s Huawei that is making up ground faster than OnePlus, LG or Sony. Huawei has announced the P20 and P20 Pro at an event in Paris – two phones that look an awful lot like the iPhone X.
Hopefully these aren’t just copycat phones, though. With top of the line specs, superb design traits and genuinely innovative camera set ups (particularly on the triple lens Pro), the P20 and P20 Pro are pushing the envelope in terms of Android hardware. It's worth noting that Huawei has changed up its model naming system. The logical name for this year's range was the Huawei P11, following on from the P10, but the firm has jumped to P20 instead. The expected P20 Lite was not mentioned at the event but it does exist. Here’s all you want to know about the Huawei P20 range. When is the Huawei P20 release date? Despite saying the phones would be available immediately on a global scale, the P20 and P20 Pro go up for pre-order on 28 March ahead of a 5 April release date. The phones are unlikely to come to the US any time soon given the furore over the Mate 10 Pro launch and intelligence services’ suspicion of Huawei’s security. How much will the Huawei P20 phones cost? In the UK, the Huawei P20 costs £599/649€ (approx $849) SIM-free via Carphone Warehouse and the P20 Pro will set you back £799/899€ (approx $1,100). The P20 Lite is £329 (approx $460). You can get the P20 and P20 Pro from networks including Carphone Warehouse, EE, O2, Vodafone and Three. Those who order before 5 April will get a free pair of £329 Bose QC35 II noise cancelling headphones. Huawei also announced the Porsche Design Mate RS which costs 1,695€ for the 256GB model and 2,095€. It's unclear where this will be available to buy. The P20 and P20 Pro are the high-end phones here and both have comparable specs, including Huawei’s Kirin 970 processor that's found in the Mate 10 Pro. They are noticeably different to the P10 and P10 Plus. The inclusion of a notch, vertical camera protrusion and a metal and glass design means the P20 is undeniably influenced by the iPhone X. Even if the Essential Phone had a notch first, Huawei has obviously taken design cues from Apple’s latest, just as Asus has done with the Zenfone 5. Hopefully this will turn out to be a fortunate form of flattery rather than a misguided copy tactic. The P20 comes in black, champagne gold, twilight, pink gold and midnight blue while the P20 pro is available in black, midnight blue, pink gold and twilight. The pink gold and twilight colours are particularly striking, with chromatic gradient colours that shift in different lights. The screen on the P20 is a 5.84in 2244x1080 18.7:9 LCD display while the Pro is a larger 6.1in OLED with 2240x1080 resolution. 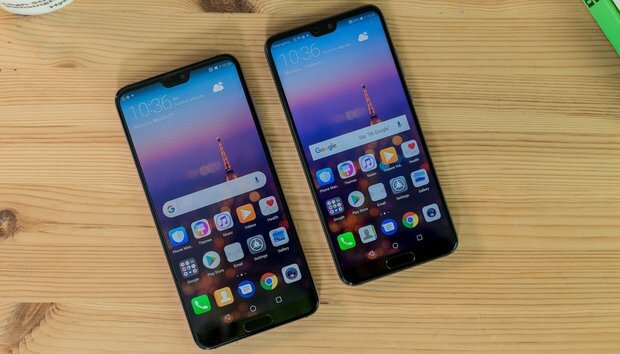 Huawei labels both as ‘fullview’ displays. The P20 and P20 Pro lack a headphone jack, though Huawei supplies USB-C headphones and a 3.5mm headphone jack adapter in the boxes. Interestingly, there is an option in the display settings to hide the notch by introducing a black strip at the top of the screen. Clearly Huawei knows not everyone is going to love the design, so it’s a clever way to keep people from moaning about a feature that is inevitably going to crop up on several flagship smartphones this year. The P20 has a 12Mp colour and 20Mp monochrome sensor with f/1.8 and f/1.6 apertures respectively. The P20 Pro impresses further with a triple camera set up, with a 40Mp (yes, forty) colour, 20Mp monochrome and 8Mp telephoto lens. It’s worth noting only the 8Mp lens has OIS, meaning the other two sensors on the Pro, and both on the regular P20, only have AI-assisted stabilisation rather than physical stabilisation. Huawei claims the tech inside the phones, especially the P20 Pro, assists photography that lifts results above its competitors (though all manufacturers claim this, obviously). The Pro’s 5x optical zoom is certainly impressive and a good differentiator. In sample shots though the P20 Pro can deliver some outstanding low light shots. In fact, the Pro has the highest ISO ever on a smartphone at an insane 102,400. For reference, the iPhone X’s ISO is 5,400. The Pro can take photos even if the light level is one lux. Suffice to say our full reviews of both devices will address these claims. As with the Mate 10 Pro, Huawei makes some bold claims about artificial intelligence on the P20 and P20 Pro. As with all claims by smartphone manufacturers, this is not really AI – but the software smarts on the P20s are clever enough to take notice of, despite the shaky association with AI. Like on the LG V30S ThinQ, the camera can intelligently select the correct shooting mode. You can also trigger Amazon searches on images UI-wide with a press of two fingers. Face unlock is also touted to be ‘100% faster’ than on the iPhone X and Galaxy S9. Both phones ship with EMUI 8.1 based on Android Oreo 8.1 out the box. It still looks an awful lot like the Android cousin of iOS, and is often a far cry design-wise from stock Android. EMUI 8.1 brings new, P20-specific voice commands with Google Assistant. We will review both devices in the coming days to see how they stack up against the competition.